One of the many blessings of living in the Southwest is the ability to reach amazing geological locations within a day span. 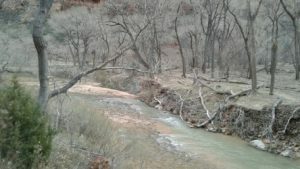 Over the holiday break, I had the opportunity to go to Zion National Park, the most visited and beloved National Park that I have been to thus far. Zion National Park is between Springdale and Kanab, Utah, a couple of hours north of the Grand Canyon and a bit south of Bryce National Park. 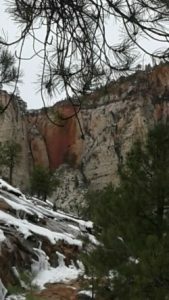 I have only been to Zion National Park during it’s “on” season, and thought it to be a grand idea to visit Her when the snow meets Her Crest. From San Ramon, California, it took approximately 11 hours to get there, landing me in Springdale area around 11 pm. I slept in my car, excited for the opportunity to see the sun rise over the canyons. The cold kissed my cheeks and kept me warm in Her own poetry. As I rose from my slumber, the light dimly lit up the canyon walls through cloudy skies. Knowing already where my next endeavor would take me, I drove to the parking lot at the Grotto, where I would leave my car to begin the escalation up to Angel’s Landing. In comparison to ‘on’ season, there was a minimal number of people wandering around the chills of the park. Meandering onward toward the summit of the landing, my eyes followed sounds of the wind to the walls that surrounded my Self. 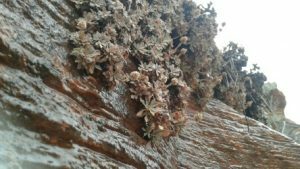 Regardless of winter’s escapade, plants still suckled the sweet waters of melted snows and the blue opaque rivers. Sage greens lined the river beds in their high trunked outfits and swaying branches. 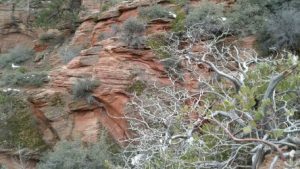 Red ran down the sides of canyon walls to remind me of my Moon and the cycles that move within my own embodiment of physical life. The sound of rivers always have a nullifying effect on my human existence. It is as if the voices of ancestral hopes for rains and waters come rushing through my system, the songs that my lineages way back sing to bring nourishment to the Earth. And here the Waters flow, rushing, chaotic and fertile. Bring life to spaces in corners and in Bigger-than-Self areas. In Ken Wilbur’s book “Up from Eden,” the energy that up-rises in my body reminds me of the Level 2 ‘Magician Phase,’ where the dissociation of Self from “outside of self” is not 100% obvious to the human psyche. Like a dream state, the rivers become my internal dialogue, talking to the cells who have known this water since the age of time. This is healing. This is Be-ing. As I walk along the river path, I reflect the questions people have asked me. What is Transformational Ecopsychology? What do you do with it? Great questions – and can be answered by the sounds of wind caressing plants. By the way stars reach our pupils at night, and the chills along hairless sleeves as the coyote clan saunters in darker hours. 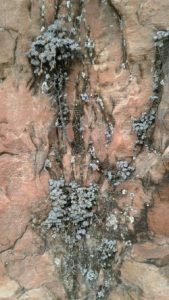 It is relation to the Iron cascading down Zion’s walls, a seemingly permanent imprint that I relate to with my own embodiment of Spirit within this human landscape. For my Self, Transformational Ecopsychology is the Re-homing of Spirit into the Human and the Wild. 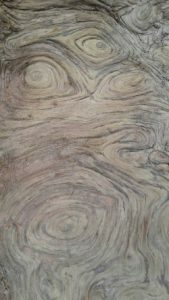 The Natural World as a healing process for integration of what may have once been ripped apart by painful experiences. It is in the sweetness of honey in un-polarized space, of connecting to the Nature Within and Without. It is seeing all parts of the “outside” world as “within,” our relationship with that All. I could go on. And yet Transformational Ecopsychology is more of a non-verbal experience. And what do I do with it? I allow this exchange of information occur without much postulating of my Mind’s ideas of what is supposed to be considered “healing.” I allow the ancestors that live in my Bones and my Blood talk to the ancestors of other Be-ings that have existed with us this entire time. Like bringing a pup to a park to play with other pups, the millions of cultures and organisms that live within me are continually exchanging information to the outside world in collaboration, in peace, in living with all aspects of the life With-In and With-Out. It appears that my Mind has a tendency of not being on the “same page” with everyone else! For this, I am thankful. I am thankful for Cycles, for the Holy, and for the Movement. For the Chaos and Respective Revolution, of Growth. I am thankful for Discomfort and shedding Layers of Self. And for gaining New Ones. I am thankful for Zion, and the cool breezes that hint at me, wink at me, nod at my existence, and teach me Lessons. Sing me Songs. Tell me Poetry. Poetry in the form of the Formless, of the Void, and of all that Is. Cold whispering at my ears. Taking their turns up rocky ladders. Grandmothers and the Mothers before them. Rene Tricou is a first year graduate assistant student at Southwestern College pursuing a Master in Art Therapy and Counseling.